The opposing forces are ready. Well, when I started this post I thought they were! In a previous post I showed the situation in Poland on 1st September. Here is how the forces available for the local battle were decided. I am using “Axis and Allies” (A&A) for the overall strategic campaign and “Memoir 44” (M44) with local adjustments for the tabletop battles using appropriate 1/300 or 1/285 scale miniatures and Kallistra terrain tiles. This is very much a game based on history rather than a historical game. Rule: only forces orthogonally adjacent on the map may participate in battle. The attacker (current active country in the Strategic game) selects a target map square and a primary attacking unit. Any other uncommitted unit adjacent to the target square may be included as reinforcements. The defender must fight with whatever unit is in the target square but may also be reinforced from neighbouring squares. For this battle Germany is attacking with 2nd Panzer supported by 1st Infantry against the Polish 1st Infantry. All other forces are pinned or not directly adjacent to an enemy. Note that I am not calling these strategic units Divisions, Corps, Armies or anything else. The entire Polish national defence is represented by four units, so maybe they could be called “Armies”. We shall see as the war progresses. To determine the forces available to each commander the appropriate number of Memoir 44 dice are rolled. This process will be carried out at the start of each battle, so the commander on the spot will have a variable force available from battle to battle. This will make it more interesting and I can rationalise it by claiming that this was the key point in the bigger picture. All forces for this battle are fresh and complete, so 8 dice are rolled for each A&A unit. Why 8 dice? Mainly because that’s how many are in the box but also because it gives a reasonable sized force for a 4ft x 3ft table, which with 10cm hexagons neatly replicates the 13 x 9 hexagon board in M44. The dice are cubic, with the faces marked as infantry, infantry, tank, grenade, flag and star. For those unfamiliar with the game system the relevance of these symbols in play will become clear in the battle reports. German 2nd Panzer uses the “armour” conversion table. 1 star = 1 unit of 3 half tracks. Note that no infantry were rolled on this occasion. German 2nd Panzer force September 1st 1939. GHQ models on Kallistra hex tiles. German 1st Infantry uses the “infantry” conversion table. 1 flag and 3 stars: these dice are rerolled to obtain specialist units. 2 tanks – 2 units of 3 rifle squads and an anti-tank rifle. 1 star = 1 unit of 3 trucks. At this point I realised that I have only prepared one rifle/AT infantry unit. Rather than delay this battle I rushed to the toy cupboard to dig out some replacements, so the second unit is Heroics & Ros figures on somewhat different bases, seen in the top left of the picture below. German 1st Infantry 1st September 1939. GHQ and Heroics models on Kallistra hexagon tiles. Polish 1st Infantry also uses the “infantry” conversion table. 1 grenade = 1 unit of 2 horse towed guns. 1 flag and 1 star re-rolled. 1 tank = 1 unit of 3 rifle squads and an anti-tank rifle team. 1st Polish Infantry September 1st 1939. 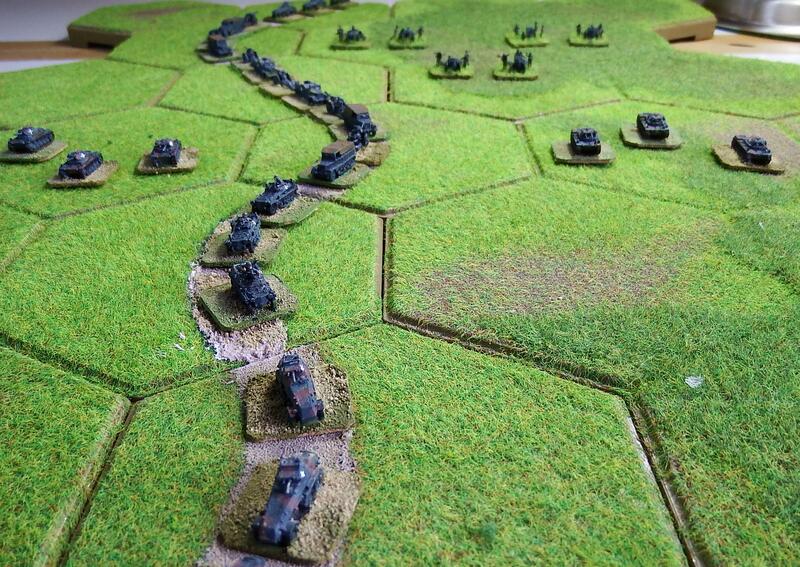 GHQ models on Kallistra hexagon tiles. In my next post I will show the forces in detail. Next Next post: September 1939 – the models in detail.